Partick Thistle were kidnapped by the SAS. But how much did Gary Caldwell know? "The van doors opened, guys with masks rag-dolled us out, head-locked us, flipped on the floor. We were blindfolded with ear muffs on. They were dragging us about rooms bouncing us off walls in total darkness." Partick Thistle are second-bottom of the Scottish Championship. 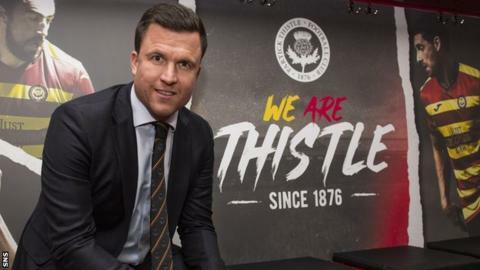 Their bleak start to the season spelled the end for boss Alan Archibald but under his successor, Gary Caldwell, the Firhill side have failed to win any of their five matches. Caldwell decided to do something different - radically different. He arranged for his team to spend a day with the British Army's Parachute Regiment based at Garelochhead in Argyll and Bute. One player ran off into the hills and was hauled back by four soldiers. Another broke down in tears. It was a team-building exercise that pushed them to their limits. This is what happened when the SAS "kidnapped" the Partick Thistle squad. Veteran striker Kris Doolan suspects Caldwell was unsure just how gruelling an experience he had prepared for his players. "He was literally told to bring the players to the training base and the army would take it from there," Doolan told BBC Scotland's Sportsound. "We went up into the hills. We had a shot of their night vision, a wee look at their guns and artillery, and we assumed that's what the full day was going to be. "Then bang, three buses turned up, dropped us off in three groups at separate destinations. We had checkpoints, and you had to run from one to the next. There were about three, four, five miles in between each one. And at each checkpoint there was a different activity and you had to do what you were told. "You were in groups with people you might not speak to a great deal. We were carrying logs together, up and down hills, through water, carrying 20 litre cans of water, stretchers with casualties on it. You didn't want to give up because you'd be letting your team down." After galloping around the Scottish countryside, the exhausted players were relieved to be told their day was done. Then the SAS arrived. "I could hardly pick my head up I was so tired," Doolan said. "They told us to take our stuff off and jump in the van. The guys were shouting, 'we'll take you for some food'. "Five minutes later, bang bang, doors open, guys with masks rag-dolled us out, head-locked us, flipped on the floor. We were blindfolded with ear muffs on. They were rough with us - it was a whole new level. They were dragging us about rooms bouncing us off walls in total darkness. "Brice Ntambwe got out and ran away but it took four SAS to put him down. Jack Storer was crying at one point. Looking back, I thought it was very worthwhile and a lot of character-building and skills we can take back to the pitch. It'll certainly bring people closer. "The manager's got a saying - get comfortable being uncomfortable. You have to find ways of coping and dealing with pressures that come along. The army base was certainly uncomfortable but we all found a way to get through every exercise they gave us and we finished it very strongly."